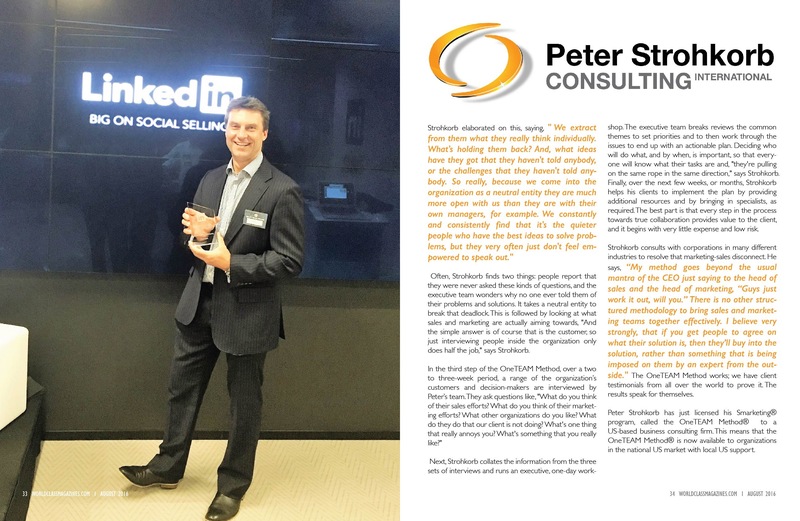 “I sometimes joke that sales and marketing teams talk more about each other, than to each other,” says Peter Strohkorb (http://www.peterstrohkorbconsulting.com/). 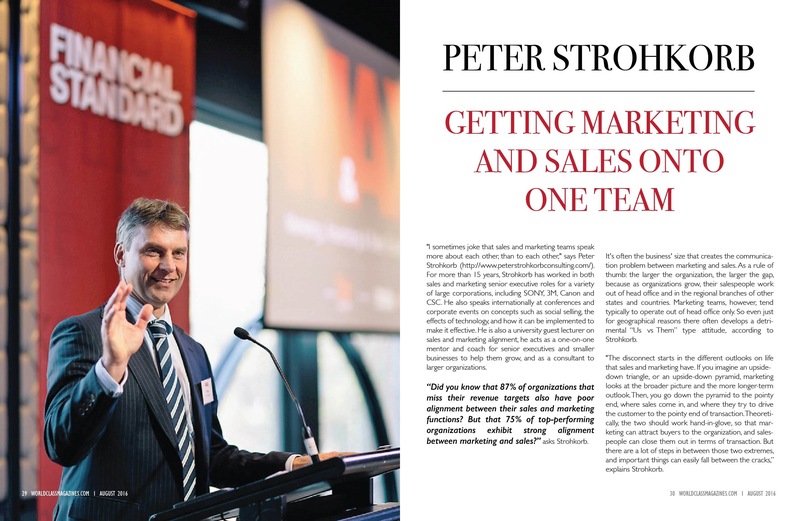 For more than 15 years, Strohkorb has worked in both sales and marketing senior executive roles for a variety of large corporations, including SONY, 3M, Canon and CSC. He also speaks internationally at conferences and corporate events on concepts such as social selling, and the effects of technology and how it can be implemented to make it effective. He’s a university guest lecturer too, on sales and marketing alignment, and he acts as a one-on-one mentor and coach for smaller businesses to help them grow, as well as a consultant to larger organizations. “Did you know that 87 percent of organizations that miss their revenue targets also have poor alignment between their sales and marketing functions, but 75 percent of top-performing organizations exhibit a strong alignment between marketing and sales?” asks Strohkorb. It’s often the business’ size that creates the communication problem between marketing and sales. As a rule of thumb: the larger the organization, the larger the gap because as organizations grow, their salespeople work not only out of head office but in the regional branches of other states and countries. Marketing teams, however, tend to operate only out of head office. So, even just for geographical reasons, there often develops a detrimental “Us vs Them,” type attitude, according to Strohkorb. “The disconnect starts in the different outlooks on life that sales and marketing have. If you imagine an upside-down triangle, or an upside-down pyramid, marketing looks at the broader picture and the more longer-term outlook. Then, you go down the pyramid to the pointy end, where sales come in, and where they try to drive the customer to the pointy end of transaction. Theoretically, the two should work hand-in-glove, so that marketing can attract buyers to the organization, and salespeople can close them out in terms of transaction. But, there are a lot of steps in between those two extremes, and important things can easily fall between the cracks,” explains Strohkorb. This is because the way that sales and marketing teams are measured and rewarded are actually quite different. While marketing is more focused on the bigger picture of brand image, thought leadership, creating awareness and the brand’s profile, the sales team is more concerned about the shorter term outlook and with how much money they can bring in each month, each quarter and each year. This creates an increased sense of emergency on the sales side than on the marketing side, which can result in mutual frustration. Tension can also build because marketing might think that they generate all the best sales leads, and that sales just doesn’t follow them up out of laziness, but sales might think they aren’t good leads at all. Many organizations jump into solving this problem with the latest technology, but despite the advice of many IT vendors, Strohkorb explains, it isn’t a problem that can simply be fixed with CRM or marketing automation systems. The solution needs to start with the people, using something he calls the OneTEAM Method, to get sales and marketing to collaborate together more effectively. Once you get people to agree that working together is a good idea in the first place, and you get them to agree on how they want to work together, then you can support them with the right technology. This is the only way to create a solution that will last and one that extends beyond the walls of head office. Strohkorb’s book, “The OneTEAM Method: How Sales + Marketing Collaboration Boosts Big Business,” (https://www.amazon.com/OneTEAM-Method-Marketing-Collaboration-business) describes the three phases that corporations go through during this process. It’s aimed at CEOs that want to increase their organization’s customer experience, revenue and profits, as well as at leaders that want their teams to hit their sales targets, and marketing leaders who want to work more effectively with their sales counterparts. It’s also of interest to IT managers who want a better return on their information technology, and human resource managers that want to create an environment where people collaborate together more effectively, enabling them to attract and retain better talent. Large corporations often begin with what Strohkorb calls a “silo mentality,” where both sales and marketing have their own silo, and they’re not really communicating effectively, especially beyond the department heads. Then, a lot of organizations move to a “process mentality,” where they adopt technology, rather than leading with people. They agree that marketing will create marketing-generated leads to hand over to sales, which then become accepted leads, and they try to agree on what a lead is, so sales can follow-up on everything, but really, all they’ve done is to agree to work together along a certain process. Strohkorb explains that the trick is to get away from the blame game between marketing and sales, and to look for ways to do things better, instead. The first step is to run an internal, anonymous, survey with sales and marketing and to provide an executive review of the findings. Then, they can see how they compare to other organizations with a score for their collaboration capability between 0 and 100 points. It also provides a starting point for improvement over the next 6-12 months. “We come in, and we put a finger on the pulse of the organization and say, ‘Where are your sales and marketing people today in their mindsets attitudes, and beliefs, and what ideas are hidden under the surface?’ And, through this very cheap, very quick, and very non-disruptive survey, in a blame-free environment, we really extract a lot of value for the organization because for the first time, the executive team get an insight into what people on the front line of the business really think and feel,” says Strohkorb. This initial survey can take between two and three weeks, including setup, management, analysis and the executive review. After that, they can decide if they want to go on to the next step, which is individual one-on-one interviews with both the sales and marketing teams. This can be done either over the phone or on Skype, anywhere in the world, and it takes about the same amount of time, i.e. two or three weeks. Often, Strohkorb finds two things: people report that they were never asked these kinds of questions, and the executive team wonders why no one ever told them their problems and solutions. It takes a neutral entity to break that deadlock. This is followed by looking at what sales and marketing are actually aiming towards, “And the simple answer is of course that it is the customer, so just interviewing people inside the organization only does half the job,” says Strohkorb. Next, Strohkorb collates the information from the three sets of interviews and runs an executive, one-day workshop. The executive team then reviews the common themes to set priorities and to work through the issues to end up with an actionable plan. Deciding who will do what, and by when, is important, so that everyone will know what their tasks are and, “they’re pulling on the same rope in the same direction,” says Strohkorb. Finally, over the next few weeks, or months, Strohkorb helps his clients to implement the plan by providing additional resources and by bringing in specialists, as required. The best part is that every step in the process towards true collaboration provides value to the client, and it begins with very little expense and low risk. Strohkorb consults with corporations in many different industries to resolve that marketing-sales disconnect. 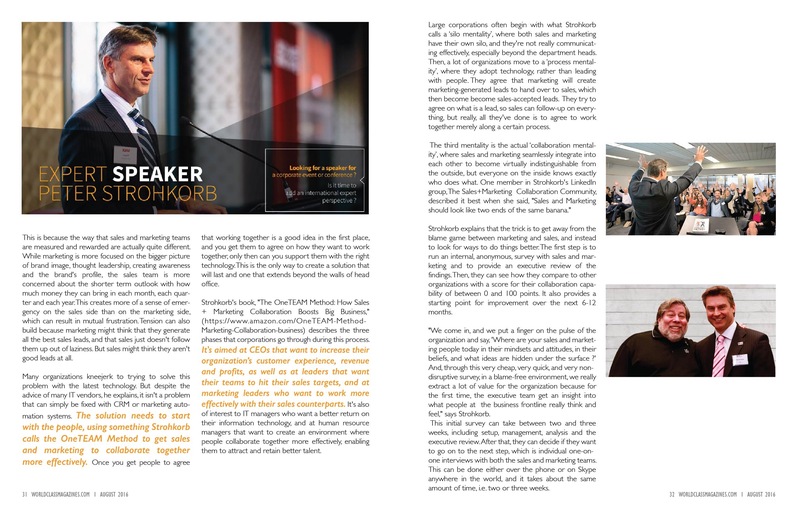 He says, “My method goes beyond the usual mantra of the CEO just saying to the head of sales and the head of marketing, “Guys just work it out, will you.” There is no other structured methodology to bring sales and marketing teams together effectively. I believe very strongly, that if you get people to agree on what their solution is, then they’ll buy into the solution, rather than something that is imposed on them by an expert from the outside.” The OneTEAM Method works; we have the client testimonials to prove it. The results speak for themselves.